work at all. During the winter it is critical to your safety for the heater to be able to defrost/defog the windows. Hot engine coolant flowing through the heater core provides the source of heat that is distributed through the vents to warm the vehicle and defrost/defog the windows. Clogs-Clogged passages in the heater core dramatically effect the efficiency of the heat exchange. Products like leak sealer and improper type of antifreeze are the most common culprits in this type of problem. Leaks- Leaking heater cores are common and many times the cause of the leak is improper coolant maintenance of the cooling system. As the coolant ages, it becomes slightly acidic and this can cause a condition known as electrolysis. Dissimilar metals in slightly acidic coolant can cause erosion of the metal. When enough of the metal sealing surfaces erode, the seal fails and a leak occurs. Cracked or Broken Coolant Tubes- Coolant travels through small tubes into the heater core from the engine. Many manufacturers make these out of plastic and over time, they will crack or split. One of the primary causes is heat cycles. The tube gets hot, then cold, then hot again. This heat cycle will cause the plastic tubes to become brittle. The heater system in your vehicle is an important part of making your vehicle comfortable and safe to operate. By staying on top of your maintenance you can dramatically improve the life of your heater core. 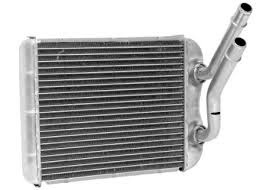 Come to Kool Kar Auto Repair for all of your heating and cooling system maintenance needs.